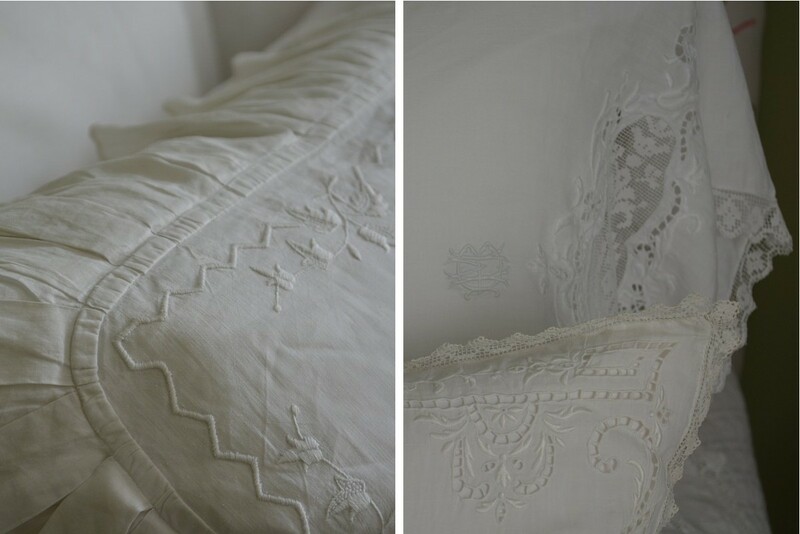 The one little luxury I can't live without is my vintage French linen sheets. I first found them at the Sandwich Flea Market years ago. Simple and elegant with an amazing monogram (really, a work of art), and a drape like no other bedding I had felt, I just had to have them. What I didn't realize is that once I slept on linen sheets I would be hooked. Over the years I have collected vintage linen sheets and shams. Some were simple, while others were embellished with artistic monograms. These, combined with a Bella Notte Linens white linen duvet cover, make an unbelievably comfortable year-round bed. So much so, that when I travel I usually bring linen sheets with me. Linen bedding is beautiful, timeless and unbelievable comfortable. Linen is best known for being an ideal summer fabric. It can gain up to 20% moisture without feeling damp to the touch and it is highly permeable, allowing for air circulation to keep it cool and dry to the touch. No matter the temperature, linen maintains a fresh and crisp look. Laundering linen is also a breeze and it gets softer with each and every wash! Linen bedding is simplified elegance! Get the Look ... Bella Notte Linen Bedding available in 19 colors. Need even more of a linen fix? View more linen bedding.